Students from Malaysia’s Sunway College have traded the tropics for Melbourne’s wintry weather to continue their business degrees at Victoria University (VU). About 50 students from Sunway College (external link) in Kuala Lumpur and Johor Bahru (external link) have just arrived in Australia to complete their VU Bachelor of Business degrees in Melbourne, specialising in accounting, banking and finance, international trade, and marketing. The students are part of the VU/Sunway credit transfers program (external link), whereby students who enrol in a VU Bachelor of Business with Sunway College can choose to transfer to Melbourne for as little as one semester or as long as two years, to complete any one of 13 Bachelor of Business majors. Speaking at a welcome lunch on Wednesday (July 26), Professor Colin Clark, Dean of the College of Business, said the VU/Sunway partnership will enable the students to gain invaluable international experience. "Sunway and VU have a very special, longstanding relationship of working together for more than 20 years to teach VU degrees at Sunway campuses," Professor Clark said. "As students, I think it’s great that you not only have the choice to complete a VU degree in Malaysia, but also the opportunity to study and live in another country to broaden your social network," he said. Dr Jayce Naidoo, senior lecturer in the College of Business who coordinates the offshore Sunway program, said the students have made a great choice in transferring to Melbourne to undertake part of their studies. "Melbourne has been chosen as the world’s most liveable city for the fifth year in a row, so you’ve come to the right place," he said. 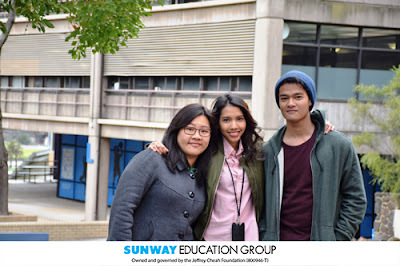 Sunway marketing students Huiyun Fong, Ili Farina Mohdizam and Ray Garcia (pictured L-R), said they are excited to commence their studies at VU in Melbourne. "I like to meet new people, discover new cultures and learn new languages, so that’s why I decided to come to VU," Ray said. "I was in a bubble in KL and I needed to get out and experience a different way of living, so I thought why not Melbourne because it’s the world’s most liveable city," Ili Farina said. Huiyun said she is looking forward to learning real-world business principles: "The courses at VU don’t just prepare us for exams – they prepare us for the workplace." The Sunway program is administered by VU College, a specialist pathway institution of VU that manages the University’s delivery of international programs and partnerships.